For years, Democrats have been on the receiving end of political attacks about rising Affordable Care Act premiums. But the roles are about to be reversed — and it's not clear whether Republicans will be able to avoid the blame. Why it matters: Not only has the GOP failed to fulfill a key campaign promise, but it's also going to get slammed for allowing things to get worse for voters. "As of now, they own the whole issue," Doug Holtz-Eakin, a former advisor to John McCain's presidential campaign, told me, adding that an exchange stabilization bill could help. Yes, but: Most congressional Republicans haven't changed their tone, saying the ACA is at fault and it must be repealed and replaced. It's striking how differently congressional Republicans sound from Republicans off the Hill. Democrats are planning to completely flip the table on Republicans going into next year's midterms, railing against them for inaction leading to higher premiums for consumers. Republicans dismiss this, insisting the ACA and Obama will shoulder the blame, but others aren't so sure that's the case. What to watch: Whether the outside voices start to infiltrate Capitol Hill, giving the broader swaths of the GOP more incentive to take legislative action. "I think everybody understands higher premiums are a result of the Affordable Care Act, and the insurance commissioners were planning on approving higher rates because of the Affordable Care Act no matter what happens," said Sen. Cory Gardner. "Obamacare's to blame because it is still firmly in place, unfortunately," said House Ways and Means Chairman Kevin Brady, emphasizing the House passed its replacement bill. "I think it doesn't matter who is to blame as much as who is in office when bad things happen," a senior GOP aide told me. "When bad things happen while we're in charge, we get the blame – whether or not it's actually ours." "The Republican establishment's sabotage of the healthcare markets will absolutely be an issue in the midterms. With unified Republican control of government, voters know Speaker Ryan and House Republicans are to blame for higher premiums," said Tyler Law, a spokesman for House Democrats' campaign arm. Democrats blaming Republicans for higher premiums "won't influence the average GOP voters or Trump voter. The real concern is will it influence independents and will it improve voter intensity and turnout," one GOP lobbyist said. Chris Condeluci, a former GOP Finance committee staffer, said Republicans could lose the blame game through campaign ads and media coverage. But, on the other hand, he said, voters understand the ACA's consumer protections raise costs. An August poll from the Kaiser Family Foundation found that 60% of voters believe President Trump and Republicans are responsible for what happens with the ACA, although only 36% of Republicans thought this. 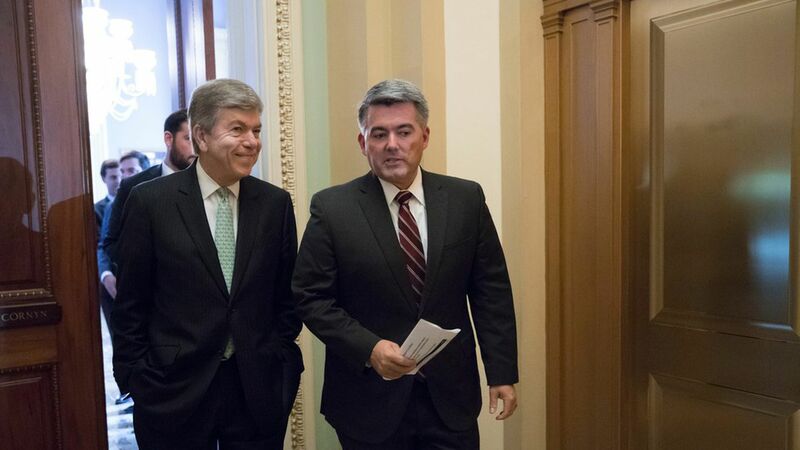 "Republicans shouldn't be blamed for those, but it's likely that there'll be plenty of blame to go around, and we'll get more than our share of it," said Sen. Roy Blunt, a rare acknowledger of the party's dilemma. "I would think everybody gets blamed," said Democratic Sen. Joe Manchin, who's been vocally pushing the bipartisan stabilization effort and is up for reelection in 2018. "Even though it may be one or the other's fault, the people in West Virginia think, 'All you people are crazy. You let my rates go up. That's just ridiculous.'"